When I saw these tasty looking little bears in one of my favorite Cape Cod candy shops, I just knew I had to have them. Gum drops plus licorice in a cute little bear shaped package… what could be better? The bears are larger than a regular gumdrop, but are the same texture and consistency. They are covered in granulated sugar, and all are black. At first taste, it’s hard to even tell that anise is an ingredient in these tasty little cubs. They are very sweet, and the anise flavoring, which is milder than licorice root, is almost difficult to distinguish. I would even hazard to say that someone who doesn’t typically like licorice might find these acceptable. For those of us who happen to love licorice, these are so mild that it’s nearly impossible to get too much of the delicious flavor. If I had to find one fault with this selection, it would only be that the bears are a little too large to eat comfortably in one bite. Despite that, these were definitely one of my better buys, and I would highly recommend them, both to those who join me in licorice addiction, and those who just enjoy a really good gumdrop. 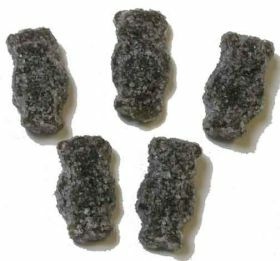 almost looks like a black sour patch kid. What Cape Cod candy store are you talking about? I live on Cape Cod and can never find Anise Bears anywhere! Hmm, I honestly don’t remember which one it was, but it was probably the Candy Cafe in Hyannis, next to the giant Christmas Tree Shop.